Can fashion ever be sustainable? There is a new buzz-phrase in fashion circles: ‘sustainable fashion’. A number of Universities now offer Masters courses in the topic. But can there ever be such a thing as ‘sustainable fashion’? Fashion, by its very nature, encourages a buy-now-discard-tomorrow culture. Most fashion trends last less than a season. High street retailers are motivated to produce clothes that will fly off the shelves, but which the consumer will need to replace in a short period of time. Economic drivers encourage cheap production of clothes and rapidly changing high-street window displays. The relatively low cost of high-street fashion items and the fast turn-around of trends works against sustainability. People are no longer motivated to mend that worn pair of baggy jeans when drain pipes replace them as a trend. Fashion, therefore has huge sustainability implications. The environmental, social and even psychological effects of fashion are increasingly coming to light. The environmental consequences of the fashion industry are well-documented. The resource demands are no small deal: the water resource required to grow and process cotton for just one T-shirt is estimated at around 600 litres (Turley et al 2009). Intensively grown cotton also produces toxic waste. It accounts for a quarter of all pesticide use in the US (Claudio 2007) and has negative effects on eco-systems and food chains as recently suggested by the controversy over bees and neo-nicotinoids. Irene Griffin (left) from Falmouth University and Dr Clare Saunders (right) with exhibits from the Fashion Footprints travelling exhibition at the launch of their new research collaboration. Clothing is also considered to make a significant contribution to anthropogenically induced climate change. The Department of Environment, Food and Rural Affairs (DEFRA) has identified clothing as the biggest single material contributor to carbon emissions, producing twice the carbon emissions associated with producing aluminium. Around 90 per cent of clothes in the UK market are imported, mainly from Asian countries, attractive to industry for low costs, with high ‘clothes miles’, associated pollution and inequality. The 2013 disaster in the Rana Plaza building, Bangladesh, brought the social externalities of fast-fashion into sharp relief. There, low paid textile workers were ordered to work in a building visibly structurally damaged on the day it collapsed, injuring over 2,000. In return for hard labour, workers are paid a pittance. Fashion also contributes to insecurity, psychological illnesses and eating disorders. Moreover, individuals remain unskilled in making and mending clothes for themselves, resulting in a sense of powerlessness. Reversing fast-fashion is no simple matter. Many are aware of the dark side of fashion, but they get caught in a value-behaviour gap because low quality disposable fashion dominates the market; and ethical clothing is considered unfashionable/unattractive, is a niche market and is expensive. Low quality fast-fashion items are more readily available in the market place, making it difficult to behave in an alternative manner. Furthermore, clothing has deep connections with individual identities, socio-economic status, emotions and lifestyles, and is rooted in socio-cultural attachments. 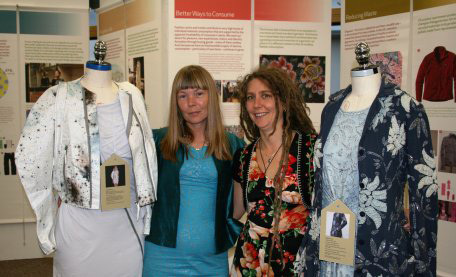 In the Environment and Sustainability Institute at the University of Exeter, I’m working with textile artist Sue Bamford on a project that seeks to understand whether teaching people to make and mend clothes helps them to develop more sustainable clothing choices. Given the nature of the fashion industry described above, we prefer to talk of ‘sustainable clothing choices’ than ‘sustainable fashion’. We will be offering four free half-day clothes-making workshops to interested individuals. The research element involves conducting interviews with participants prior to and after their clothes-making workshops to monitor any changes in their clothing choices. Individuals interested in participating in the project should email me on c.saunders@exeter.ac.uk. This entry was posted in business, community on 21st Aug, 2014 by Lara Faith Cronin.